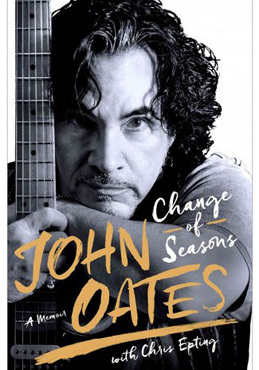 This week (March 28) Oates will be releasing his autobiographical book, Change of Seasons: A Memoir (St. Martin’s Press). In the book, Oates chronicles his life story, telling many stories about his years growing up, his 45 years in the best-selling duo Hall & Oates, his solo work and his personal life. He discusses all the eras, personalities and music that have shaped his life and career. This May, Oates will be back on tour with Hall & Oates—the duo is launching a North American tour that starts on May 4 in Tulsa, OK. It will be a co-headlining tour with British pop/rock band, Tears for Fears. As part of this tour, Hall & Oates will be headlining the first Hoagie Nation Music Festival in Philadelphia on May 27, which will include Tears for Fears, G. Love & The Special Sauce, Vivian Green and other artists. We are pleased to do this new Q&A interview with John Oates. But before we get started, here’s some information about Hall & Oates, Oates’ songwriting credits, and his solo albums. Hall & Oates has recorded 21 albums, with seven albums being certified multi-platinum or platinum, and six albums going gold. Hall & Oates were formed in Philadelphia, and they are known being one of the acts that helped create the classic “Philly soul sound” of the 1970s & 1980s. The duo has sold over 80 million units, making them the most successful duo in rock history. In addition to his work with Hall & Oates, in 1999 Oates embarked on a solo career. He has released five solo albums including Phunk Shui (1999), 1000 Miles of Life (2008), Mississippi Mile (2011), a live album called The Bluesville Sessions (2012), and Good Road To Follow (2013). He’s also recording a new album called Hurt, which will be released in 2018. 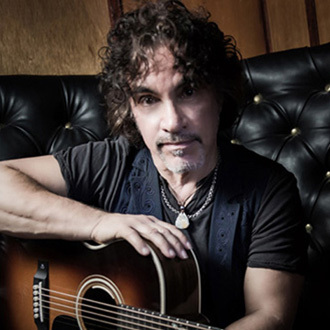 Here is our Q&A interview with John Oates. He talks about his new autobiography, how he wrote some of his classic Hall & Oates hits, and his solo work. DK: You’re releasing your autobiography, Change of Seasons: A Memoir. What are some of the things people will learn about you, when they read your book? John Oates: Well, hopefully they’ll think I’m an interesting person who’s led a very interesting life (laughs). I think they’ll find out what makes me tick as a musician, and the things I care about in life and music. They’ll find out that in my childhood I was heavily influenced by traditional American folk, blues and roots music, before I met Daryl (Hall) and we began working together. And in a way, how I’ve returned to that in my later solo work. [Over the years], I think I’ve met a lot of interesting people, and had a lot of unique experiences. Hopefully, there’s a few lessons to be learned. Things you know…about the trappings of success in the music business and things like that. So it’s a multi-dimensional story—there’s a lot going on in the book. I guess the main thing about the book, is that it’s about transformation. It’s a book about growing up and coming up with a strategy, so that I could live the rest of my life the way I wanted to and still continue to be a musician. DK: One of the songs you’ve written is a ballad called “Change of Seasons.” Did you name your book after this song? Oates: Yes, because that title seemed to really exemplify what the book is about. It’s about changing, and it’s about evolving and trying to change over the years…the process of maturing. That’s what the book is about. I wrote that song back in the late ‘80s – early ‘90s. It was a time when I was going through a lot of personal sruff—business things, getting divorced, financial things—and I really wanted to start over again. I wanted to re-create my life in a much better way that could take me forward into the future. DK: During the past few years, you’ve been inducted into both the Rock & Roll Hall of Fame and the Songwriters Hall of Fame. How does it feel to receive these two great honors? Oates: Well, it’s wonderful to be acknowledged for the work you’ve done, and to be singled out among the many thousands of musicians, that your work and dedication to your craft has been appreciated by many people. The Rock & Roll Hall of Fame, in a way, feels like a lifetime achievement award. The Songwriters Hall of Fame was certainly an acknowledgment of the music and songs that we had written that have somehow stood the test of time, and hopefully become part of the history of American music. And that’s very important to me. DK: Switching to your upcoming Hall & Oates tour, I read you’ll be launching a new tour with Tears For Fears. Is it a co-headlining bill? Oates: It’s a co-headlining bill, but someone has to go on first. Well actually, we have a [soul/R&B artist] named Allen Stone who’s going to do a short acoustic set, and then Tears For Fears will go onstage, and we’ll go on after that. DK: I read that you’re playing a Hoagie Nation Music Festival show in Philadelphia in late May, with several other bands. Can you tell me about this show? Oates: Yeah, the mayor of Philadelphia was looking to do a signature event, and he reached out to us. He happened to be a fan, and we wanted to jump on board with him and do that. We thought it was great, and we’re looking forward to it. Philadelphia has become a bigtime foodie town, and we want to celebrate the food and drink of Philadelphia, and also the music. So there’s going to be lots of bands, some Philadelphia-centric, and some other bands as well. So hopefully it’ll become a successful festival, and become a multiple-day event. DK: Moving on to your songwriting and your hits with Hall & Oates, what was your general songwriting process, writing with Daryl Hall? Oates: The best way to describe it is…there were no rules. We’d come up with ideas individually usually, and then share them. We’d play them for each other and kind of bat them around. And then we’d edit each other and make suggestions. Sometimes it would be like a real collaboration…50/50 from the beginning. But many times, one of us would have the idea and be the custodian of that idea, and the other person would help. That happened a lot. A lot of times, Daryl wrote a lot more music than I did, and I would work with him on the lyrics. So really, there was no way to come up with a pattern. We just took it however we could get it. DK: “She’s Gone” was an early hit for you. I read that you came up with the chorus first and then played it for Daryl, and then you both finished the song. Is that how this song happened? Oates: That is correct. I came up with the chorus idea…it started out as a very acoustic, folkie kind of thing. I played it for Daryl and he liked it. He started playing a verse, and played the signature piano riff which has become the verse. Then we wrote a verse together, and we adapted the chorus to fit the more groove-style verse. DK: Another great song was “I Can’t Go For That (No Can Do).” That song has such a cool groove. How did you co-write this song? Oates: Well actually, that happened at the end of a day in the studio. Everyone had gone home except the engineer, Daryl and myself. Daryl just walked up to a keyboard and he turned on this little, primitive drum machine, the Roland CompuRhythm, and it just had a very simple, straightforward beat, and he just started playing a left-hand bass line that you hear (he sings the bass line), and then he just started riffing. He was really in a zone and came up with this thing, and I grabbed my guitar and played the little guitar part. And really, there’s nothing on that record except for the keyboard, guitar, [the drum machine], a little synth overdub, the sax and background vocals. And that’s it. That (No Can Do)” at The Troubadour in Los Angeles. DK: It’s amazing how it can be a simple process or simple instrumentation, to create a song that becomes a classic. Oates: Oh yeah, and sometimes it’s just the inspiration, you know, and you go with it. DK: Your song “Maneater” has a great title and concept. Who came up with that title? Oates: I did. I came up with the whole idea for the chorus, writing “Oh here she comes,,,” (and the rest of the chorus). But I wrote it originally as a reggae song. It had a reggae groove, and it sounded really cool as a reggae groove. But then Daryl and I got together and we just said, “You know, reggae’s not the right thing for us.” So he came up with the idea of doing it more in a Motown style. He played that Motown piano thing which gave it that “bomp bomp bomp” (rhythm) thing, and so we just went with that. DK: Moving on to your solo work, you’ve released five solo albums. For fans who would like to explore your solo work, which of your albums would be a good starting point for them to check out? Oates: Hah! The one I’m working on right now! (laughs). It’s always the most recent album. Songwriters always want to talk about their most recent stuff. But no, my solo albums have formed a progression. The first one, Phunk Shui, was really just a collection of odd ideas that I had to get off my chest. So it didn’t have much coherence to it. The first coherent album was the one I made in 2007; it’s called 1000 Miles of Life. It was the first solo album I made in Nashville with Nashville musicians, and it was a very personal album, a little bit serious…overly serious in a way. But really, unbelievable playing and great production on that. Then I moved into an album called Mississippi Mile, and that was the album where I realized that what I wanted to do. I wanted to pay tribute to all the roots and traditional blues and folk musicians who kind of made me who I am as a musician. So I think that album is the real signpost for where I was going as a solo artist, because I had the revelation that I needed to go back to my earliest influences and use those as a starting point to go forward. Then I made Good Road To Follow, which was a collection of collaborations with a lot of really great people. It had everything from pop music to blues to folk to swing. So I think what I learned was, that my earliest influences of traditional American, early rock & roll, Delta blues and folk had become the foundation for everything I do as a solo artist. DK: You mentioned that you’re working on a new album. Can you talk about this album and when it will come out? in New York in 2009. Oates: Yesh, I’m working on it right now, it’s called Hurt. It started out as a tribute to (bluesman) Mississippi John Hurt—he was a big influence and hero of mine. But as I got into it, I began to assemble this unique group of musicians with unusual instruments for a blues record—cello, pedal steel, guitars, mandolins, drums, bass. And the album began to take on this very unique, modern Americana version of a traditional blues album. So I went with the flow of what was happening, and the album is evolving now into a very unique patchwork quilt of roots styles. I hope to have this album out in 2018. DK: I was listening to your Good Road To Follow album, and there are two pop songs, “Pushing a Rock Uphill” and “High Maintenance,” that sound a bit like Hall & Oates songs. Is there a possiblity that you and Daryl will record a new Hall & Oates album? Oates: I don’t think so. Daryl and I, you know, have creatively gone our separate ways. He has his great TV show (called Live From Daryl’s House), and he’s very passionate about that. I have my collaborations and my projects that I’m doing. So when it comes to new Hall & Oates music, I don’t think that’s [what we’ll be doing]. We’ve already made more music than we could play in a lifetime. We still get together and tour as Hall & Oates, and we play a lot of that stuff and it’s fantastic. I love doing it. But I also love going about my own thing.